Starring Anthony Wong (黄秋生), Kent Tong (汤镇业), Wayne Lai (黎耀祥), Kenneth Ma (马国明), Myolie Wu (胡杏儿),Louisa So (苏玉华), Ron Ng (吴卓羲) and Alice Chan ( 陈炜), TVB Anniversary drama “Lord of Shanghai” <枭雄> will be premiering on October 26. Set in the turbulent 1900s period in Shanghai where warlords ruled the day, the drama begins with Kiu Ngo Tin (Anthony Wong), who is determined to make a name for himself in the city. He becomes sworn bothers with Kung Siu San (Wayne Lai), a warlord who reigns over the harbor, and together, they built up a successful underground empire. With his quick wit, Ngo Tin is soon talent-spotted by lawyer Chak Kam Tong (Kent Tong), who moves seamlessly between both the upper crust and the seedy underbelly of the society. Kam Tong places his trust in Ngo Tin and instructs him to help with taking over a rival’s opium business. With the help of Siu San’s military forces, Ngo Tin manages to complete the mission. Over time, with the establishment of the Republic of China, the business set up by Kam Tong, Ngo Tin and Siu San flourished and turned the three men into the most powerful men in Shanghai. Nevertheless, the three men constantly fight to become the sole most powerful man in Shanghai but become embroiled in trials and tribulations in the process. Ngo Tin falls in love with Pekingese opera star Ku Siu Lan (Myolie Wu), who does not reciprocate his feelings. Ngo Tin resigns himself to marrying another Pekingese opera actress, Cho Yuet Lan (Louisa So). When the Japanese invade China, Ngo Tin is moved by the anti-Japanese efforts of a union leader and joins the cause, lending both financial and personal support to the Marco Polo Bridge Incident (a battle between the Imperial Japanese Army and the Republic’s National Revolutionary Army). This drives a wedge between Ngo Tin and Siu San, who chooses to betray China and help the Japanese. Finally, after the war, Ngo Tin emerges as the most powerful man in Shanghai, only to be betrayed by his close subordinate and confidant, Lai Siu Hong (Ron Ng), who publicly accuses Ngo Tin of having betrayed China during the war. Ngo Tin is left with no choice but to escape from Shanghai and restart a life of anonymity in Hong Kong. This article was written by Jingles for JayneStars.com. 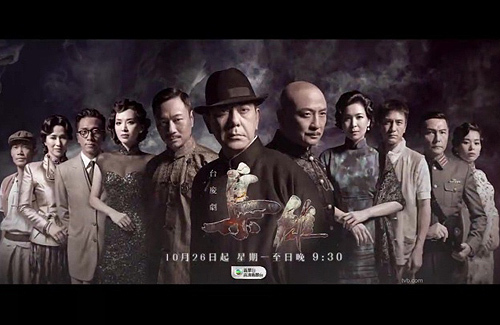 Since Myolie is no longer with TVB, she has been relegated to the corner in the poster of “Lord of Shanghai”. @jayne I was looking for Myolie Wu in the photo, and could not find her. The one standing next to Wayne Lai did not look like Myolie. If you did not tell me, I might not find her. Life is just too cruel ……………… Once she left, her value to TVB no longer existed. @jayne OMG wow! Good observation! totally didnt see that coming! This will be the only TVB series I will watch this year. Looking forward to Anthony Wong’s acting. Don’t care for anything/anyone else. @kaykay408 if you’re referring to the lady between Ron and Pierre, that’s Jade Leung. I hate this period of drama the most. But I do want to show support for the cast. Same, but I don’t care. In it for Anthony. I’m only going to watch this because of Anthony. Haven’t watched a TVB drama for the past 1 year. I’m only concerned that Myolie would ruin this drama. She’s very good looking but the moment she speaks or acts all that good look goes out of the window. She just can’t act period.